BOUNCEinc, the free-jumping revolution that has been rapidly taking the world by storm, has finally arrived in South Africa. 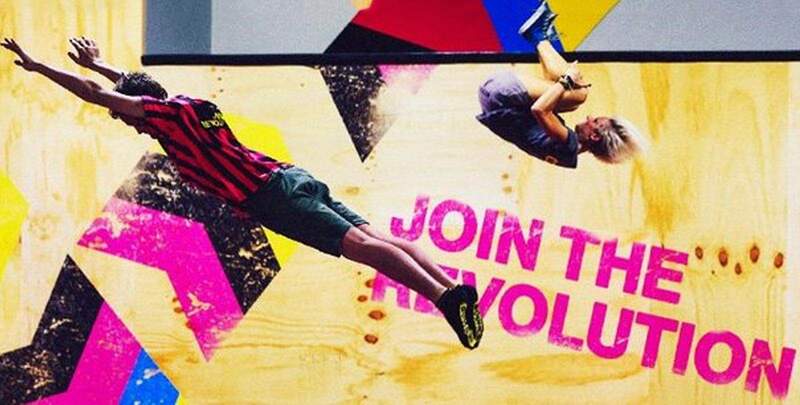 The ‘revolution’ started taking shape roughly 4 years ago (2011), when entrepreneurs, Antony Morell and Simon McNamara, were on a trip in the USA, and came across a trampoline park in San Francisco. The park which catered mainly for kids, got the pair thinking of how they could make it more accessible to all age groups. A year later, they launched BOUNCEinc, in Melbourne, Australia. It is now three years on, and they have parks open all over Australia, the United Kingdom, Dubai, and now South Africa. Myself, Hans and Andy were recently invited to the launch of BOUNCEinc South Africa, and what an exhilarating night out it was! We made our way to The Waterfall Lifestyle Centre in Midrand with a mix of excitement and a bit of apprehension, since we had no idea what BOUNCEinc was about. Thankfully, our apprehension turned to childlike excitement the moment we walked through the doors of BOUNCEinc. My inner five year old immediately took over as I looked around in awe at all of the “jumpers” [that is what patrons are called – Ed] and the bright colours that engulfed all of the many interconnected trampolines that filled every space of the park. We quickly put all our valuables in the lockers provided, put our bright “grip socks” on and ventured into the world of BOUNCEinc. We started with some free-jumping to get warmed up before slowly moving on to greater challenges, like Dodge Ball. Have you ever played Dodge Ball on a trampoline? It is just as exciting as it sounds, but boy is it challenging. Constantly trying to keep your balance while jumping and avoiding getting hit by a foam ball, is not an easy task. Nevertheless, it was a thrilling [and very sweaty – Ed] experience. After jumping, dodging and diving for about 30 minutes, we needed some sustenance. A brief snack was had at the BOUNCEinc shop before we continued exploring the large premises. A highlight of the evening was watching a few of the professionals, show us their jumping and flipping skills. It was a spectacular show of skill, fine-tuned technique and a lot of enthusiasm. Say hello to the #Bouncfie! Thoroughly enjoying #BounceINCSA. Excellent experience. BOUNCEinc employs youngsters, in their 20’s, who have experience in gymnastics and acrobatics, and who are trained in CPR and First Aid. Bounce South Africa has approximately 70 young men and women in their employ, who take their jobs very seriously. At each jumping station, a staff member informs you of all the jumping rules for that specific area, before psyching you up for the experience. There are “wandering” staff members all around, showing off their skills, engaging with jumpers and pointing out what can be done on certain trampolines. I was marvelously impressed with their friendliness, helpfulness and especially their “mad skills”. After ogling the staff and other more skilled jumpers, we made our way to The Big Bag, which was my personal favourite part of the evening. The Big Bag is a really large bag that you jump and land onto. My first attempt saw me land, not-so-gracefully, on the edge of the bag, which prompted several staff members to embarrassingly gather around me to check if I was hurt and, naturally. to help me out. After giving everyone a bit of a giggle, I went in for attempt number two and totally nailed the landing the second time round. The evening ended all too quickly, as it normally does when you are having fun, but in a way I welcomed ‘the end’ as my entire body started feeling like jelly from all of the bouncing. As we were heading back to the lockers to put our shoes back on, we rubbed shoulders (literally) with none-other than one of the founders, Antony Morell. A tallish, slightly eccentric looking man, with glasses and messy blonde hair; he is exactly the kind of person you would expect to be the founder of something so exotically fun. We left the park satisfied and exhausted, with the promise that we would return. Pricing: a normal jumping session will cost you R140 per adult, and R100 for “junior jumpers” the first time around, as the first visit includes the BOUNCEinc grip socks. Sessions are discounted during off-peak times (weekdays from 10am to 3pm), costing R115 per adult. Sessions after your first, will cost less provided you bring your grip socks along. The cost then drops to R110 per adult, and R95 for “junior jumpers”. You can also book kids parties, adults’ parties and corporate events, as well as fitness classes and coaching sessions for the adventurous among us. Pricing for these can be confirmed through the website or the booking hotline. Locations: For now BOUNCE has only been launched in Johannesburg, but Antony intends on expanding and opening parks in Cape Town, Port Elizabeth, Durban and Pretoria, although no dates have been confirmed. BOUNCE approved grip socks must be worn on all trampolines. Only one person is allowed on a trampoline at a time. You may only land on your feet, bum or back. No food or drink near the trampolines. No jumping under the influence of drugs or alcohol. Junior jumpers must stay within their designated area, for safety reasons. Lastly, what and what not to do: This is just some advice I want to offer first-time jumpers, as I was not fully prepared for the experience. Wear comfortable clothes! I recommend sweat pants and a tight fitting t-shirt (things tend to flap about when you jump). Ladies: don’t bother with makeup. You will sweat it off in the first 10 minutes, and most likely end up walking out looking like Alice Cooper. Bring along a sweat towel and wear plenty of antiperspirant (things heat up after a few minutes of jumping). Stay hydrated – seriously, drink a lot of water. Just enjoy yourself. Jump, play, laugh, whatever! It truly is a wonderful experience, one which I will be sure to return to.